I hope everyone enjoyed their spring break and had a nice first week back at school. It is great to see the campus full of life again. On Tuesday, I sent an update to the community on NYA’s strategic priorities. A link to this letter may be found here. 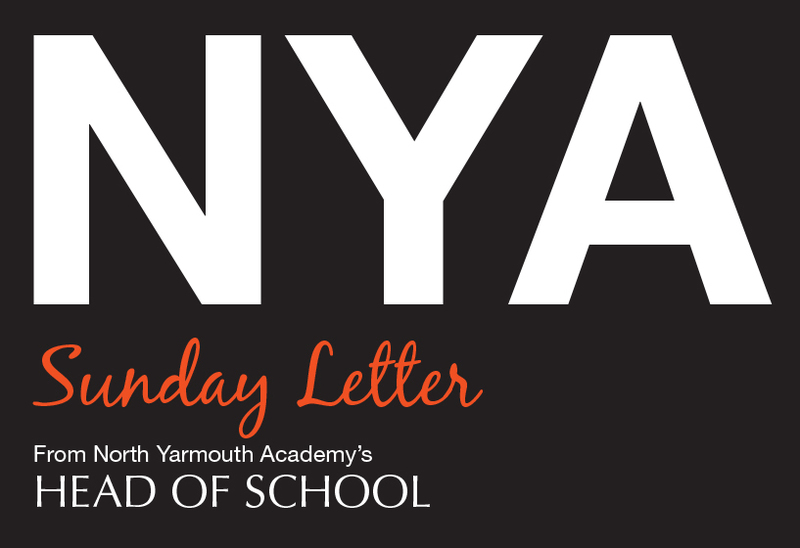 The letter includes updates on all of NYA’s strategic priorities including the student experience, enrollment, operations, and master campus planning. Updates on the new learning commons and other capital projects were also included in the letter. If you have questions on any of these exciting initiatives, please don’t hesitate to reach out. Upper School athletic recognition was Tuesday evening, officially marking the end of the winter season. Thank you to Mr. Hardy and the athletics staff, our coaches, and all of the student athletes and managers for a successful winter season. Middle School spring athletic practices began immediately following spring break, and most Upper School practices begin tomorrow. Best of luck to all of NYA’s student athletes this spring. Thank you to Mr. Gagne, Mrs. Grant, and the additional faculty who volunteered to take the ninth grade to Boston on Wednesday aboard the Amtrak Downeaster. The students explored artifacts from ancient Greece and Rome in connection with their history and English classes. Each student created a brief video description of their artifact based on their research. With the educational work done, groups explored the various neighborhoods and shopping districts of Boston, and reported from the busy Boston Common that spring is indeed on its way to us here in Maine. Students in the Lower School are currently reading all of the 2019 Chickadee Books and will vote for the Maine Chickadee Awards on Tuesday, March 26. They will gather as a group in the Middle School Community Room, and one or two students from each class will do a short presentation on one of the books prior to the voting. It is something the Lower School has done every year, and students really look forward to it. They put a lot of thought and work into their book talks. There is no better way to learn about the impact of an NYA education than meeting with our alumni. This past week, NYA hosted events in NYC and Boston, and I was able to meet with over 60 NYA alumni. Their feedback is valuable. During the events, alums reconnected, shared NYA experiences, networked and participated in the NYA Show Your Love challenge. The Show Your Love campaign is an opportunity for everyone in the community to support the Academy. Gifts to NYA provide vital support for academic programs, athletics, arts, faculty, financial aid, student life, and more. If 300 individuals make a gift to NYA before midnight on March 31, Board President Allen Bornheimer ’60, GP’30 will give $30,000 to the Academy Fund. I hope you will donate and help unlock this challenge gift for NYA. Plans for the Soirée are well underway. The Soirée is a major fundraiser to support the student experience, and this year’s paddle raise will support STEM education. Your investment is critical to enhancing STEM education for all students. Funds raised will support new courses and resources for all divisions and hiring a STEM champion to the faculty who will help drive curriculum innovation at all grade levels. Formal invitations will be sent soon, but in the meantime visit the Soirée page for information or to register for the event.